Well yesterday I got a D- in my Math test. I was crying a lot. But in my French test i got a A+. My parents were happy and not happy at the same time, so they were so-so. Wait a sec sob sob cry cry. OK I'm back; well, now im going to school. Hope I get a really good mark today. Also yesterday I went to KARATE lessons!!!. I learned TYKIO SHUDAN that means A combo in JAPANESE. Posted by Juan at 7:34 a.m.
hi juan! you're so cute! i'm happy to hear that you are into blogging..keep it up and also be good at school. 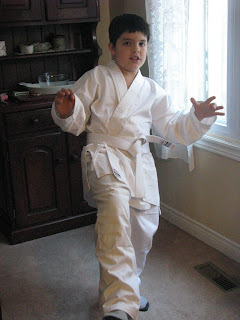 Juan, you look nice in that karate uniform! Keep that up...I'm into Taekwondo too and I'm telling you...they're good for your health! February 8, 2008 at 9:01 p.m.